We spent yesterday afternoon at the Las Vegas Traders Expo. It was a great opportunity to get in the trenches, talk to other traders (both experience and green), vendors, brokers, etc. We delivered a speech on option selling which gave us an opportunity to network with a community of traders that shared our advocacy of the strategy. Many of the option sellers we spoke to were primarily (without diversification in other markets) selling puts against stock indices (S&P, NASDAQ, Russell). Not surprisingly, all of them have had a great run throughout the last few years (I only wish we would have been smart enough to be "all in" on short index puts). We are well aware that 2013 has seen a raging bull market in equities, and there is no telling when or where the party will end. Nonetheless, each day that goes by with traders growing more an more complacent in bullish strategies, raises the stakes. Complacency will eventually lead to panic; it always does (unfortunately, there typically isn't a happy medium). Similarly, just as a market can get overcrowded and become vulnerable to a sharp correction, perhaps the strategy of selling stock index puts has become overcrowded. If the market ever pulls back, the short put traders will likely be forced to sell futures to hedge their option bets...due to mass quantities participating in this strategy, there could be significant fuel flaming the fire. We certainly aren't looking to chase prices lower, but it feels like there are a lot of speculators doing just that. Our guess is that we'll get some follow through selling into tomorrow, but we'd like to find a place to re-sell the puts we bought back on Monday. The 126 puts we paid about 8 ticks for are trading near 25 again (our original sales price), so this time around taking the quick profit worked very well. If everything goes as planned we might get a chance to re-sell the same strike for more premium, or better yet a lower strike. We are looking for the mid 130s in the long bond but in our view such a price could offer nice support. The price we were comfortable getting bullish at, has come and gone. We suspect follow through buying early next week will lead to a 133 print in the December ZB (127 in the note), but it doesn't make sense to chase prices (at least not aggressively). Thanksgiving trade tends to be bullish for Treasuries. 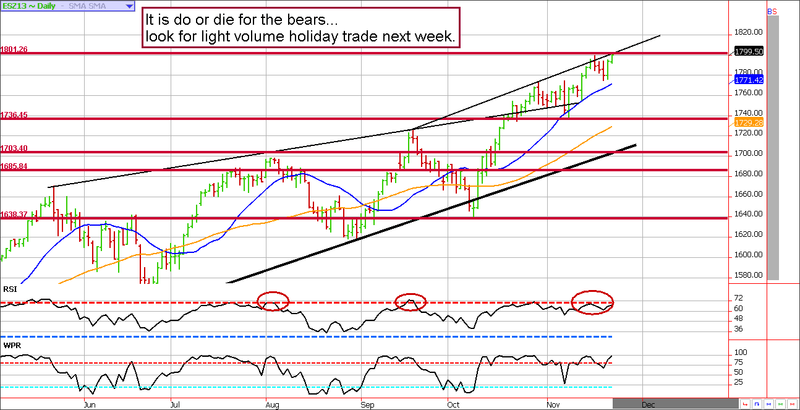 Look for a possible light volume grind higher into the holiday. **Consensus:** 'Tis the season for higher bonds and notes, we're looking for 133ish early next week. October 8 - Sell January ZB 126 puts for about 25 ticks or $390. October 18 - Buy back the January ZB 126 put near 8 ticks. Depending on fills, you should be profitable by about 16 ticks or $250 per contract before commissions and fees. The bears have everything they need for a possible reversal; overbought oscillators, trend channel resistance, and complacent investors. The only thing missing is sellers! In today's grind higher, it was clear that there weren't many buyers, but there were even fewer sellers. If the bears can't find a way to turn the corner here, any shorts (and there aren't many) still hanging on to positions by their fingernails, will lose patience and start to cover (buy). We'll see what Monday brings. **Consensus:** The correction was shallow and quick, but we are bumping up against resistance. Can we get a seller or two? October 18 - Sell the November ES 1760 calls for about 9.00 in premium ($450). October 29 - Roll the November 1760 call into a November 1780 and a December 1800. This adjustment slows the trade down (lower delta) and brings in a little more premium (about 4.50 or $225) to compensate for risk and transaction costs. If the market begins to correct, we'll start peeling risk off leg by leg. November 7 - Buy back all November ES calls to lock in a profit ahead of the employment report. Most of you have 2 lots (or more if trading multiples), one as the add-on and the other as part of the roll out of the 1760 calls. Assuming a fill near $3.50 the profit should be somewhere between $200 and $300 per contract. October 18 - We advised clients to sell their November DX 80 puts for a small profit. This lowers the break even level for the futures contract and increased the odds of success on the trade if the dollar bounces out of here, but it also opens up the downside risk exposure. October 17 - We recommended that clients sell December Euro strangles using the 140 call and the 133 put. Fills were coming back near 69 ticks, or $862.50. October 25 - We advised clients to buy back the December Euro 133 put (part of strangle) to lock in a profit of about $250 per contract before commissions and fees. 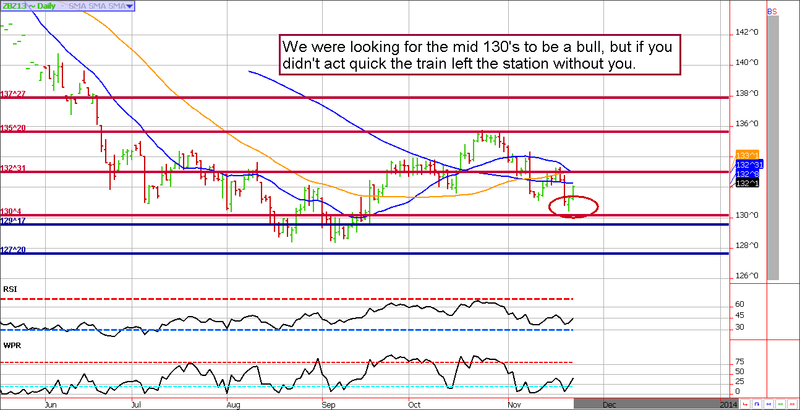 October 29 - Sell Euro 135 puts near 33 to re-strangle Euro ahead of the Fed. November 1 - Buy back 140 calls near 12 ticks to lock in gain of about $300 per contract on that leg of the trade before commissions and fees. November 4 - Buy back 135 Euro puts and sell 2 for 1 strangles using the 138 calls and the 132 puts. This can be done for a small credit. November 4 - Exit DX futures to lock in a profit of anywhere between $350 to $450 (this includes the options) before transaction costs. November 8 - Buy back 138 calls near 7 ticks to lock in a profit of about $300 per contract before commissions and fees. We'll hold the short 132 puts in anticipation of a possible bounce into next week. November 18 - Buy back the 132 Euro puts near 8 ticks to lock in a little over $250 per contract before commissions and fees (you should have 2 for every 1 of the original strangle recommendation). November 18 - The nat gas rally looks shaky, lock in a profit near $3.67. For most, this is a profit of about $350 per contract before commissions and fees. November 21 - Buy e-micro gold futures near 1240.